Writing was meant for tortoises. Although Thucydides was a very well-respected writer, he would have had no place in today’s world of reporting. Let’s face it. Thucydides was writing the stories of his life not to spread the word of current events, but to give deeper examination of the world in which he was living. Thucydides made literary works of art. 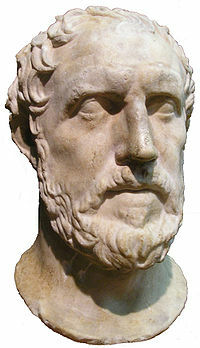 Not only did he write the facts of the Peloponnesian War, but his vivid recounts and analyses are still studied today. Internationally, Thucydides’ works are used for military purposes, political realism, and international relations. But while Thucydides made great contributions to the world of literature, he had a shortcoming: speed. At the time of his death, Thucydides was still writing his accounts of the War. However, he was almost six years behind the news of the time. In Thucydides’ effort to be highly meticulous, he had lost one of the key elements of news. Timeliness. In order for news to be news, it has to be readily available and current. Stale accounts of events are the last things that readers want to buy. Most likely, during Thucydides time, people would have respected his efforts to record accounts for the purpose of posterity. Yet, they probably looked to other newsmongers to tell the latest stories. This phenomenon speaks to today’s society as well. As the current media have evolved and became a 24 hour machine, the importance of brilliant writing has diminished. To some extent, society still values writers, but as a highly separate thing from reporters. In the media world, the best sound bites are the important things. Instead of listening to lengthy speeches or drawn out articles, we want the nuts and bolts of the situation as quickly as possible. For journalists, this means they must constantly straddle the boundary between great writing and reporting in a timely manner. In some ways, this may cause the news to suffer. With deadlines hanging over them, it may be hard to give the appropriate amount of attention to minute details that Thucydides concentrated on. Essentially, journalists must remember they are the news spreading hares of society, not the tortoises.